Update: These were discontinued first, and then the Strawberry. The only ones left are the Chocolate Ones (my review here). Three crazy days at work means not a whole lot of energy to review. Actually, I've been polishing off the Oreo Klondikes instead, but now they are gone, so what ever shall I do? Shall I suffer? NAH. 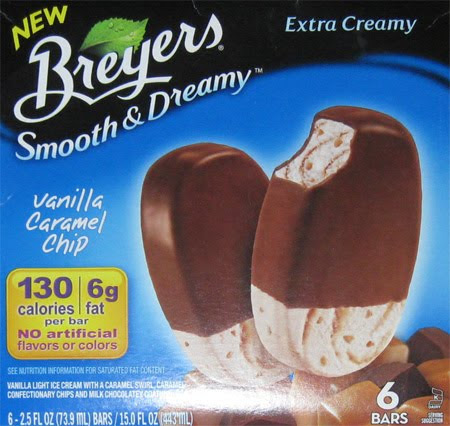 I already took some pictures of the New Breyers Smooth & Dreamy Vanilla Caramel Chip Bars from when we tried them two weekends ago, I just need a quick refresher (as in eat another one) and we'll be good to go. Now let's go eat some "extra creamy vanilla light ice cream with caramel morsels and swirls of caramel sauce half-dipped in a rich milk chocolatey coating"
Here's a first look after removing the wrapper. Like the Breyers Triple Chocolate Bars, the Caramel Bar's Chocolate only goes two thirds of the way down to help keep fat and calories to a minimum. You know, if I didn't know better, I'd swear the chocolate dip goes further down then it did on the triple chocolates. I took a second shot to help show off the caramel swirl pattern. I know I say it a lot, but I'm always hesitant with caramel. It's just so easy to overuse it and ruin the whole treat. thankfully the caramel is not that strong, and the chips are adding just a mild crunch to the whole things (not even a crunch really, just little bits of solid mass). Funny, I remember it striking me as a bit tastier last time. They aren't bad, I just thought there was a bit more of a contrast between the chocolate and the ice cream. Maybe I'm just in a picky mood. There's not much of an aftertaste either, just a faint lingering caramel I guess. Wow, now I feel guilty for trying to post. I do think it's a shame they cant bring the sat fat down a bit more. You know, I'm not loving this aftertaste at the moment. That's it, I'm giving up for now. Stay tuned for the second scoop... which is technically the third scoop... oh you know what I mean.